Want to get one dev's thoughts on this year's Code One Conference? Check out this post to learn more about Code One and room for improvement. After writing about my personal experience as a presenter at this year’s Oracle Code One, I was asked for my opinion on what could be done to improve the experience for attendees and presenters in the future. While I have a tiny bit of experience in organizing and running a conference, this year called DawsCon, having 100 attendees is not the same as having 10K+. So here are my thoughts, for better or for worse, on what Oracle’s conference organizers can do in the future. Let’s begin with the venue. The Moscone Center has over 700,000 square feet of space spread across three buildings. Code One was held in the Moscone West building, which has 300,000 square feet of conference space, such as meeting rooms and exhibition areas, and an additional 75,000 square feet of pre-conference space that effectively means lobby space on each of the three floors. This year, Code One occupied the first floor for its exhibition space and the second floor for conference sessions. The third floor was used by Oracle Open World. 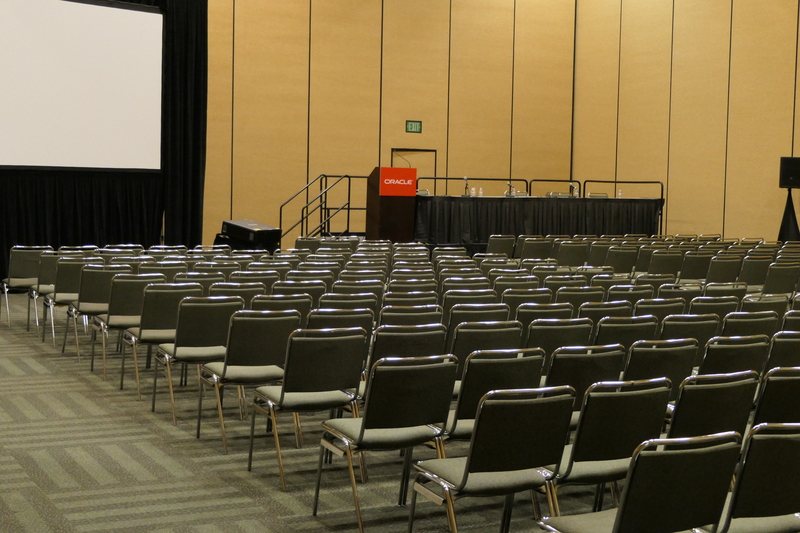 In addition, the basement of the Moscone North building, where a large presentation space exists, was used for keynotes. The remaining space in the North and South buildings were used by the Oracle Open World conference with its 40K+ attendees. The South building was torn down about two years ago and its reconstruction is almost complete. To sum this all up, the Moscone Center is huge. Therein lies the first problem with Code One this year. The venue might be too large. With a total attendance of 50K+ between the two conferences, the Moscone would appear to be an ideal location. Up until two years ago, Code One, then called Java One, was held in the Hilton and Parc 55 hotels and that is where I attended my first three conferences. The West, like all the Moscone buildings, can best be described as cavernous. Developers come to Code One to be inspired by new technologies, to learn new skills, and, most importantly, to network with fellow developers. I believe the Moscone Center is not up to these roles. Let me explain why. The conference rooms are too large. Except for the spaces used by hands on labs, all the rooms seat approximately 300. What I saw this year was that unless your session had the words Cloud, AI, or Microservices in the title, you were lucky to have between 50 and 75 attendees. If you were doing a Birds of a Feather session in the evenings, then you were lucky to have between 10 and 50 attendees. The rooms are poorly lit. While the lighting enhances the projected images, my PowerPoint slides never looked good; the general lighting could best be described as dim. Presenters were difficult to see on the podiums. There is no dedicated lighting for the podium. 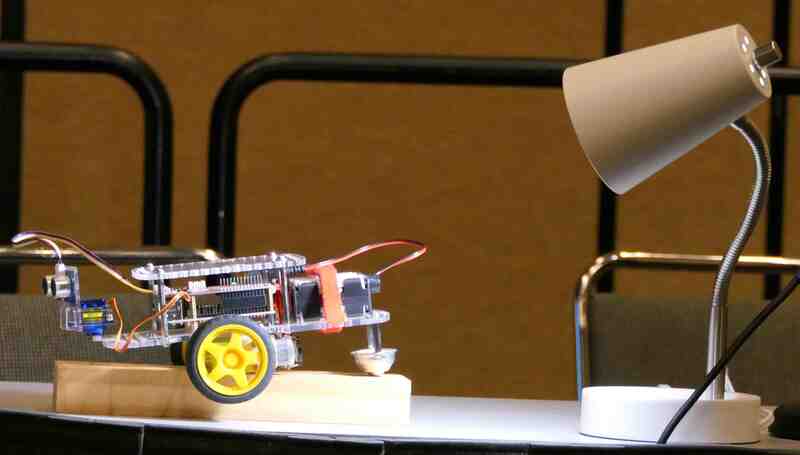 I bought a desk lamp at Target the night before my presentation on a robot car just to illuminate it so it could be seen. My own spotlight from Target. The ceilings are too high. This might seem like a strange comment, but it relates to the ambiance of the room. It creates distance between the presenters and the audience. I believe it hinders participation by the audience. Couple this with 300 seats with 50 attendees scattered throughout the room and you have the recipe for a cold and uninviting space. A standard conference room at the Moscone Center West. A similar problem exists with space where exhibitors have their booths. It’s a 100,000 square foot space that can never be described as intimate. Yet, the exhibitors for Code One need intimacy, in my opinion, to get their messages across. It wouldn’t surprise me if exhibitors had fewer visitors than previous years. Exhibitors may be every bit as important as the sessions. Exhibitors provide a sense of the direction of the industry. The first year I attended Java One there were numerous companies showing CI systems. They are all gone because CI is standard equipment and the CI companies don’t need to convince us to use their products. I’m not sure what message this year’s exhibitors were saying because, quite frankly, I felt uncomfortable in the space. If you wanted to get upset with this year’s conference then how the pre-conference space was used is an excellent place to focus your anger. If you were at Code One then you almost certainly carried a laptop. This meant that from time to time you needed to find a place to possibly do some work and communicate with your company. Maybe you needed to charge your device or you required AC to work. Other than a few tables in a hackerspace there was no place to work. If there was an AC socket in the wall you were sure to find someone sitting on the floor with their laptop plugged in. I suspect, without any proof, that some people purposely went into sessions they had no interest in, sat in the back row, and worked on their laptop because that was the only place to sit down. Why else would you attend a session with 50 other people in a room that seats 300 and sit in the back row? Some speakers are not adequately prepared. They do not have a good sense of the experience their attendees are having. We are not entertainers, though in one session I tried to be. There are some basic principles of presentation that every speaker should be familiar with. This is not the conference’s fault. The conference, I believe does have a responsibility to provide some instruction on the art of presenting. For example, how to create slides. It may be the largest projection screen your slides have ever been on, but in the back row, it's still pretty small. Increase your font size. One problem from previous years has diminished and that is what I call the “Essay on a Slide” where the slide is crammed with text. Still, every now and then a slide is so full of text that while reading it you no longer are listening to the speaker. When showing code, running scripts, or live coding increase the font size. Nothing riles me more than watching a Linux command line presentation where the text is too small to read from the third row. I have only seen a handful of presenters successfully live code. What I do when I want to show how code evolves is to prepare multiple files with more code in each file and switch between them as I talk. This year the most common keystroke during a live coding demonstration was the backspace. Rehearse, rehearse, rehearse. Have a plan B and even a plan C if something goes wrong. Be prepared to give up on your slides and coding to just talk to your audience. Listening to a presenter apologize while they frantically try and fix something that doesn’t work and is painful for the audience because we all feel the presenters pain because it has probably happened to us at some time. I believe that a conference should consider running a presenter's Boot Camp either on-site or online. We may all think we are great presenters like Venkat Subramaniam but sadly many of us come off as Donald Duck. I know this is harsh but anyone can be a great speaker as it is a skill that can be learned. I mentioned earlier that the conference used to be held in hotel conference rooms. While these rooms can be quite large, they are not as consistently as large as the Moscone. Their ceilings are a little lower. They felt more intimate. I know nothing about what Code One costs to put on and if Oracle sees a way to better manage the cost by placing everything in the Moscone then that is their right and I support it. What I think they can do is influence the center to reconfigure their space. There needs to presentation spaces that seat no more than 100 and even spaces that seat no more than 50 attendees. I was advised a few years ago to submit sessions to the Birds of a Feather evening track because they were poorly attended and so fewer presenters submitted to this track. It must be true because for the past two years I have had sessions accepted in this track. This year, I may have even broken a record by having 47 people attend one of my BOF sessions. On the other hand, in my second BOF sessions, I had zero attendees. Walking around the halls looking into other BOF sessions that night, I rarely saw more than 10 people per session. My advice— cancel the evening sessions. Conference goers are attending parties, eating out, or getting to bed early because jet lag has messed up their sleeping pattern. Heck, I had to miss a party I was looking forward to because I was presenting that evening. Continue to have BOF sessions, just have then during the day. Keep Code One separate from Oracle Open World. It's easy to spot an Open World attendee; they are probably wearing a suit while Code One attendees are in t-shirts. I visited the Open World exhibition space, and it reeked of big money. They even had better carpet padding. Open World is a very different conference and by having the third floor of West used by that conference it diluted the ambiance of Code One. Please don’t take offense, I have always wanted to reek of money although that ship may have sailed for me. Code One, as I’ve already mentioned, is very much about networking and the Moscone Center fails in this regard. Everything you have just read is nothing more than my opinion. I hope to continue attending Code One for as long as my session proposals are accepted and I can get funding for my expenses. I have written this because I believe that the conference experience for both presenters and attendees can be improved. Oracle, for a fat retainer in Canadian dollars, I’d be happy to work with you.